Just a quick note: While read/writeweb writes about information overload and how it has caused a productivity loss of $650 billion, Google boasts about having indexed 1 trillion (1,000,000,000,000) Websites. Add Email, twitter, SMS and possibly even paper producst like books and newspapers, the amount of information available – or battling for our attention – is enormous these days. Tools for searching (or: finding), aggregation, filtering and blocking will become ever more important. Reasons why brands should leverage existing networks. In discussions and social media workshops with clients there is always the one question looming: shall we hop on to existing networks or shall we build our own, new social network? A brand centric or at rather: brand-fan centric social network. Of course it’ll have all the feats like uploading content, connecting with other brand-fans, sharing, communicating, etc. Why not, there seem to be a lot of brand-fans out there! This can be a good idea depending on your objectives. But on the other hand, there are quite a few reasons, why you might want to leverage existing networks. Be it social network platforms like facebook and myspace, content networks like youtube and flickr or loose networks like blogs. how sticky are the networks, that users have already established elsewhere? Will they go through the effort of establishing yet another network? The reason I started thinking about this is the current post about identi.ca vs twitter on techcrunch. Twitter is the most popular mobile microblogging service out there, no doubt about it. But the fact, that it has experienced a lot of downtime lately (and „failwhale“ becoming regular geek speak) has put off many people lately. identi.ca offers a rationally better solution to this problem (even though it wouldn’t have had enough traffic yet to prove it). Its openness let’s you assume, that in the long term, it will be the more reliable service. But still, people seem to be reluctant to move over there. That’s what techcrunch is writing about: the problem with identi.ca is, that it is not twitter. So if a well functioning network service can’t lure people from a failing one, how are brands expecting to launch completely new network services out of nothing? Why should people start spending their time on the social network site of „FMCG brand X“ and go through all the effort finding and contacting new or old friends (again)? There might be some brands/products with such a strong fan base or such a strong communicative idea, that they can start building their fan community on their own networking site. For all others, I would probably recommend leveraging existing networking sites. At least to begin with. 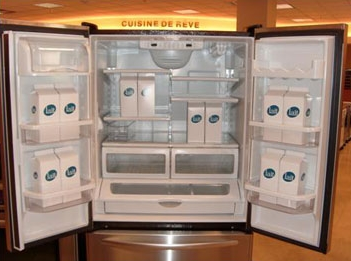 Milk producers in Quebec put milk cartons in refrigerators in ten appliance stores around Montreal to take advantage of the moving season. Apparently, that similar story about diapers and young fathers (who have to stay at home on a friday nite) is not true. The Toyota Scion social media campaign is amazing for two reasons. First, the casestudy written by the agency lists a few „rules“ for social media strategy which I find quite interesting. You can find those listed below. 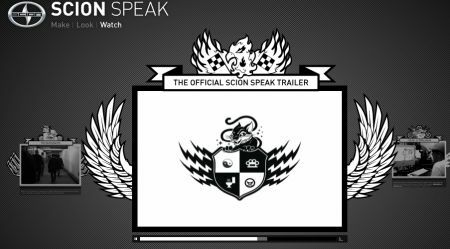 With Scion, we ensured that we developed Scion Speak in collaboration with the Scion enthusiast audience. In fact, we used some of the leaders of the existing online Scion communities to help us to develop the Scion design language. We also ensured that this brand site was designed for purely social and expressive purposes and did not feel like a corporate or money-generating venture. Define the key social behaviors of your target online. Where are they socializing? What are the social habits, (e.g., Forrester has social-networking consumer profile segments such as critics, spectators, sharers, etc.) online? Identify your brandâ€™s social behavior and objective in the social space. How should it socialize with your target? What is the brandâ€™s primary purpose in the social network? Facilitating self-expression? Listening? What is its role at this social party and what useful tools can it create to facilitate this? Create social-media content; donâ€™t advertise on it. If youâ€™re not providing content, ensure that you are providing a useful service. Social media helps people manage their social lives. It enables them to do something they are already interested in. It gives them the tools to allow for this. Social media provides a serviceâ€”information, connection points, etc. Be careful youâ€™re not duplicating established social communities. If your audience is using a strongly established community (i.e., recipe sharing), why create a duplicate, marketing-based branded version of the same community? Why would your target leave the existing community for a branded version of the same offer? 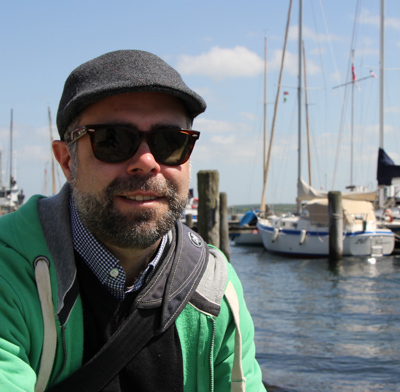 Donâ€™t hijack consumersâ€™ social networks. At the least, marketers should be invited into the social culture. But even better, marketers should create their own culture that consumers want to join. They should also be mindful of forcing friends to endorse products among their peers. Users should be voluntary brand ambassadors, not an enforced sales force. These points might make it into my set of powerpoint slides regarding social media. The YouTube Star called Fred. This is what you get, when you let the crowd do their stuff. Would any CEO of a TV station or production company have signed this concept off or given any budget for it? And how much budget would a professional production company have spent to produce these? It is surprising, to say the least, what gets popular these days and what doesn’t. Never underestimated user generated content!